An anthology of 15 short stories called Marriage and Mutton Curry. In the Royal foreword, the HRH wrote: “… The individual lives and specific events that are described in these stories convey most effectively the growing pains and the joys of a young and developing Malaya, later Malaysia." “… While the stories appear on the surface to be about the Jaffna Tamil community – depicting the hopes, dreams and foibles of its members alongside its foods, cultural and religious practices, and even its names – the insights they provide on the human condition go well beyond the experiences of any one ethnic group....."
A reading of the “Marriage and Mutton Curry” at SEKSAN 25/08/2018. On the Scene with Eugene – Dato’ Dr M Shanmughalingam – Marriage & Mutton Curry 30/08/2018. The author with his book (20180919). "Dato' Dr Shan is a master storyteller, as this collection amply demonstrates. His distintive voice and high quality of writing made for a most pleasurable, rewarding and stimulating read." "I have much enjoyed Dr M Shan's short and carefully observed stories of Malaysian life. I hope our paths may cross again somewhere in the future." "M. Shan, with his domestic ethos is, above all, unpretentious and warm. The sure sense of dialogue and timing is allied with certain originality." "Dr. M . Shanmughalingam allowed me to read his work, which proved invaluable to my understanding of the Tamils. I hugely enjoyed Victoria and Her Kimono and the humour in Shan's other stories." "Dr Shan is one of the finest short-story writers writing in English today. He is in a class of his own, enriching the genre, in fact nourishing it with subtlety and finesse." "The stories are examples of Shan's special gift of irreverent, insouciant, puckish, trenchant humour he brings to aspects of his culture and his years in the civil service. They are such exhilarating social comedy and satire." "A remarkable short-story collection, introducing a fresh, original, satirical eye cast upon a minor ethic tribe, the Jaffna Tamils, in a multiracial nation of multiplicities of ethnic tribes. The stories are compressed, their humour lightly deadly, the collection's recovery of this almost-lost tribe for Malaysian literature,"
"It's been quite a while that I enjoyed humour in Malaysia stories. But Shan's is a humour that is full of everyday irony, and therefore very humane and down-to-Malaysian-earth." "The collection is engrossing and cannot be put down. It is an invaluable addition to any who is a keen student of Malaysian Literature as well as entertaining for the uninitiated reader who may casually pick up the collection." "These stories remind us that cultural identity is both an asset and a refuge during hard times." "Shan's stories are wickedly very funny; in particular, the stories about the Kandiah family, a Ceylon Tamils. He observes them with a tolerant, forgiving eye, aware of their all-too-human foibles." "I like his empathy and kind portrayals but I also liked the darker tale of two sisters and the twins; parts I found riveting. Shan's fiction evokes the times, often much more so than many social or political histories, e.g. Hillary Mantel." "I enjoyed the humour of Shan's stories very much and his eye for irony. I think his short stories work because he is so pithy." "Dr Shan's light touch disguises a sharp satirical bent and much trenchant commentary on social and family dynamics." – Preeta Samarasan, award-winning author of Evening is the whole day. "The Tamil community and its concerns that Shan describes may have given way to modernity, but they are kept alive in these stories." Dato’ Dr M SHANmughalingam www.drshantri.com blog: www.drshantri.blogspot.com holds an Honours degree from the University of Malaya, a Masters from Harvard and a Doctorate from Oxford University. At Harvard he graduated first in class with Grade A in all eight subjects and was admitted to the Ph.D. programme directly without formal application. At Oxford he won the second prize in the Short Story competition judged by Iris Murdoch and John Bayley, Literature Prof, the poetry prize and a graduate scholarship from Balliol College. Shan’s short stories, poems and essays have appeared in national and international anthologies in France, India, Ireland, Malaysia, Singapore, the UK and the US, in universities (Harvard, Malaya, Oxford and Singapore) and in national literary journals (Dewan Bahasa). His latest short story and poem were published in TRASH: A Southeast Asian Urban Anthology and the Little Basket 2016 both launched at the London Book and Screen Week, at Kinokuniya, K.L. and Borders, the Curve, April 2016. Within 3 days of its launch TRASH was on Kinokuniya’s weekly bestseller list. Another short story was co-published in ku.lit:asian literature for the language classroom by Pearson Education South Asia Pte Ltd and National Arts Council, launched at the S’pore writers festival. One of his poems is required reading for Form Two students in Malaysian schools. He is co-editor of An Anthology of Malaysian Poetry in English with Malay translation (Dewan Bahasa).One short story won the British Council Short Story Prize and another was an Editor’s choice from 1,450 entries for Ireland’s Fish International Short Story Prize. His poems are in New Voices of the Commonwealth an Anthology of Poetry in London with Nobel Prize winners, Derek Walcott, Wole Soyinka and Seamus Heaney, ISIS, Balliol College Annual Record (Oxford) and Asianist Asia in Paris. Invited to be Session Chairman, Commonwealth Writers Seminar for Papers on Literature from Jamaica to New Zealand. Contributed essay on HRH Sultan Nazrin Shah, on his enthronement as Sultan of Perak, 2015. Malaysian Culture Group, Newsletter. Quoted in TIME magazine cover story, Dec. 9, 1996 on Tun Dr Mahathir, then Prime Minister of Malaysia. Interviewed by Le Prestige, the Victorian and on various Malaysian TV programmes e.g. profiling Royal Prof. Ungku Aziz ex Vice Chancellor Univ of Malaya and Dato’ Dr Usman Awang, national poet laureate. Reviews: For short stories, Peter Carey, twice winner of the Booker Prize and Commonwealth Writers’ Prize, in his ‘My Life As A Fake acknowledged ‘Malaysian writer, Dr M Shanmughalingam, not only offered advice and friendship but also allowed me to read his unfinished autobiography, which proved invaluable to my understanding of the Tamils…’ and wrote that he ‘hugely enjoyed Victoria and Her Kimono and the humour in Shan’s other stories.’ In the Far Eastern Economic Review (Hong Kong), The Hindu (India), The Statesman (India), the Edge, New Straits Times, Kaki Seni. Dramatised Performance Readings of short stories and poems. Featured poet at If Walls Could Talk, 1st anniv., Readings, Seksan, K.L., the Cooler Lumpur Writers Festival, a 2½ hour’s solo Performance Reading at the English Language Teaching Centre, Ministry of Education in Nilai, N.S., to 200 lecturers, teachers, trainee teachers and students, at Nat. Univ. S’pore (NUS), as solo performer, 11th Biennial Symposium on Literatures and Cultures of Asia-Pacific Region, Dome Literary Readings and with Prof Edwin Thumboo, all at NUS, at BFM Radio Station, Oxford Cambridge Society to 400 students, participant and read own work at the 26th Cambridge Seminar on the Contemporary British Writer, Cambridge Univ., U.K. Participating British writers included Doris Lessing, Muriel Spark, David Lodge, Malcolm Bradbury etc. Performance Poetry with Director, Apples and Snakes, UK’s leading performance poetry organization, Taylor’s College, Creative Writing class to 120 students, Univ KM, Voice and Place: Writers’ Forum, Substation Guinness Theatre, S’pore, Garden International School, K.L., Lycee Francais de Singapour, Symposium Singapore-Malaysian Literature, Univ.PM, Creativity and Poetry Classes, S’pore Management Univ, Malaysian Culture Group and Book Club, IIUniv.M and Litfest Univ.KM. At Bookstores: Borders, London, S’pore, Kinokuniya, MPH, World Poetry Reading K.L. at Planetarium, at Dewan Bahasa dan Pustaka and at Univ. Malaya, KL, and at several national and international readings led by the then national poet laureate, Dato’ Dr Usman Awang and Radio Fremantle, W. Australia. 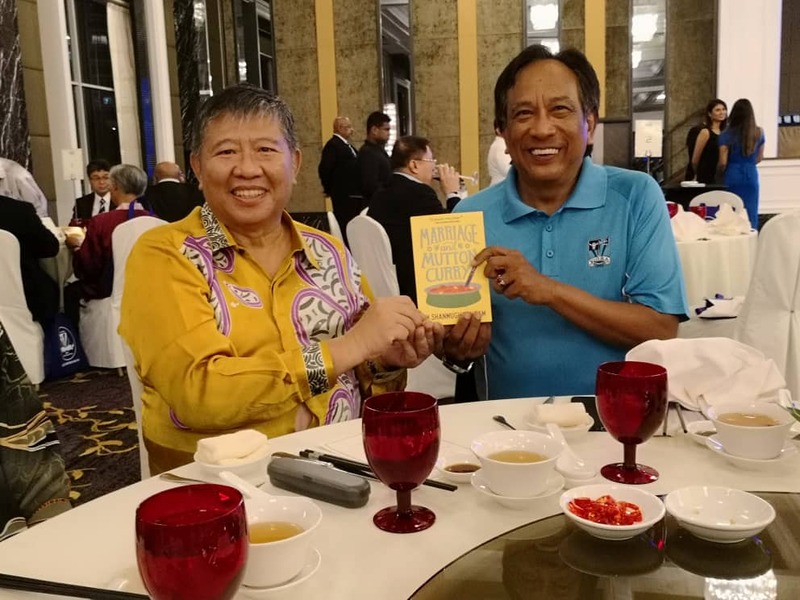 He was an interviewer on international and current affairs, film critic on Malaysian TV, and radio and a member of advisory panels to leading national literary and cultural journals in Dewan Bahasa and the informal advisory panel to TV3. Producers from Australia and New Zealand have offered to make movies of two of his short stories. His work has been the subject of theses in universities in Malaysia and Germany.